I wondered if I could build a SMS/text-based interactive fiction (IF) app. This is a story of how I researched the problem, but ultimately failed to actually execute on making one. I didn’t know what I was looking for or even if it existed, but I had the desire to play a game via SMS (simple message service) text message that would allow me to unravel a mystery – something that would tell me a story throughout the day as long as I kept interacting with it. 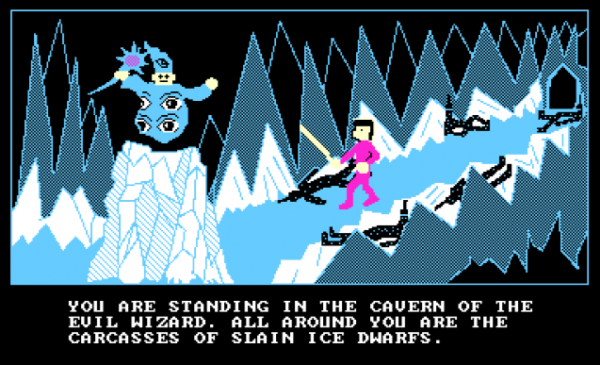 I was influenced by early childhood memories of reading “choose your own adventure” books and playing point-and-click adventure games like Shadowgate. In both cases the choices you made in the game affect the outcome and this interactivity with the story intrigued me (Note: I’ve written about games like Shadowgate before). I did searches for “SMS games” and “text message games”, but couldn’t find anything. I eventually started searching for “text based games” which led me to discover the term “interactive fiction“. I immediately recognized it as the type of games portrayed in Tom Hanks’ Big (Cavern of the Evil Wizard) and the original Leisure Suit Larry. A friend of mine had the 1987 MS-DOS game, Leisure Suit Larry in the Land of the Lounge Lizards and we would have to hide from his parents to play the game. In the game, Larry is controlled by a text parser that can interpret typed commands like “talk to woman”. You never knew exactly what to say or how the game would react. It seemed the interactive fiction community was quite small by Internet standards as I kept running across one name: Andrew Plotkin, who also goes by Zarf. That lead me to download some IF apps on the iPhone and learn about some apps you can use to create your own IF games. I looked into Twillio for the SMS gateway, but eventually I learned enough to realize I didn’t really want to make my own IF game. Sometimes I do that. I think I want to do something, like making furniture, designing an app, or designing games, and then once I know how, I stop. That happens sometimes. It may seem counter-intuitive to some to forward a SMS message to an email address when most devices that can receive text messages can also receive email, but sometimes you don’t have access to your phone, yet you still need access to the text messages. This could happen if you lose your phone, leave your phone at work or in the car, or simply not be able to bring it to work or some other restricted location. I personally started using it when my customers started texting me long requests that I’d have to retype or manually forward to get into a usable form on my computer. It could also be useful for those of you who run a business on the side and want to keep your day job. You can use tools like this to forward text messages as emails to a personal assistant or your partner. For whatever the reason, you’re probably here looking for the answer, just like I was before I found the solution. Below are solutions for how to auto-forward your text messages to email for Android, Blackberry, Windows Mobile, Palm Pre, and Apple iPhones. I use TextBusy, which works great. It requires you to use a Gmail account to forward the emails so all of the SMS messages will be coming to you from whatever address you specify. Whatever bad reviews you see out there from August – disregard as those have been fixed by now as you can see by the latest review on September 15th. For $1.23 it’s well worth the money. It currently has 9 reviews on the Android Market. txtForward txtForward automatically sends a copy of your SMS text messages to any email address you specify, for backup or as a handy way to get your messages at your desk. Send your SMS messages automatically to any email address, and easily back them up or read them from your desktop email client. It’s available for BlackBerry and Windows Mobile too. It currently has 38 reviews on the Android Market. SMS2Gmail forwards SMS and missed call information to Gmail account. This application allows you to forward your SMS messages and missed calls to a user defined gmail account, and you can activate it remotely. If your phone is at home for example and you are not, send it an SMS from a friends phone or webtext and activate this service. It currently has 57 reviews on the Android Market. SMS Auto Forward to Email lets you forward all incoming SMS messages to an email address automatically. Very handy if you keep changing your handsets or like to delete your text messages. Keep a log/backup of all your text messages. Once installed and running, you don’t need to do anything. The app runs in the background and send every incoming text message automatically to an email address of your choice. txtForward automatically sends a copy of your SMS text messages to any email address you specify, for backup or as a handy way to get your messages at your desk. Send your SMS messages automatically to any email address, and easily back them up or read them from your desktop email client. NOTE: This app does not work on webOS 2.x. SMS Auto Forward/Reply forwards text messages to the mobile number of your choice (number must be in your contacts). You can also send an auto-reply message to the sender. Your phone must be turned on and in coverage for this application to work. While this isn’t text-to-email, it may be the best a Palm Pre user can get. If you know of another app for Pre’s let us know in the comments. For those using older firmware, there is a third-party application for the iPhone, iSMS/weiSMS, with which it is possible to send text messages to multiple individuals as well as forward text messages. SMSD is a free and easy to use iPhone SMS management application which lets you delete individual Messages, backup all message through mail, manually forward messages, and manually Send/Forward messages to multiple contacts.